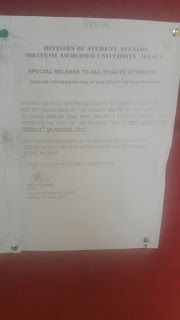 In a release signed by the recently appointed Dean of the Division of Student Affairs, Professor I. O Aransi, the division has stated that stale students of the University are expected to register at the University Health Centre on or before Friday August 4th 2017 or become bill patients. However, reacting to the development, a student who chose to remain anonymous opined that many students do not go through the registration due to the complexity and tediousness of the process, he also further reacted that except the Health Centre is expanded, registering all unregistered stale students within 14 days might be unrealistic. The news hit the waves yesterday that Osun state paid 8bn on salaries from Paris club refund and 2bn on pension. I think that was too much for recurrent expenditure. I doubt Osun generates as much and I am stunned by the possible impacts on the lives of those workers if the Paris Club Refund did not take place in the first instance. The current Nigerian structure creates states that exist just to maintain the state civil service, carry out some projects and feed the political class that their hunger never quenches. A Federal High Court based in Lagos State has ordered the interim forfeiture of an estate in Banana Island area of the Lagos state linked to former Minister of Petroleum, Mrs Deizani Alison Madueke. According to reports, Mrs Diezani and her cronies have fraudulently siphoned about $11Billion from offshore processing agreements (OPAs) popularly known as oil swap. The report also stated that during her stay in office, Nigeria lost about $50 billion in the petroleum sector. The court also ordered the forfeiture of money that been fraudulently siphoned by the former Minister during her stay in office. Justice Chuka Obiozor who presided over the case made the forfeiture order after listening to an exparte application brought by the Head of Legal of the Economic and Financial Crimes Commission, (EFCC) Mr Anselm Ozioko. Kogi State Governor, Alhaji Yahaya Bello, has announced the proscription of the Kogi State chapter of the Academic staff union of Universities (ASUU) with immediate effect. The governor announced the proscription on Wednesday after an emergency State Executive committee meeting. He then called for an immediate resumption of lecturers to academic activities or be sacked with immediate effect. The governor said his decision became necessary as all efforts to make members of the institution see reasons to call off their over six month-old-strike action had failed. OpenCon is the student and early career academic professional conference on Open Access, Open Education and Open Data. Last year's global meeting was held November 12-14, 2016 in Washington DC. And this year's global event is coming up November, 2017. - Better approach to environmental, societal issues. Kingsley Ndimele, a young African Entrepreneur is set to host an online business summit. Kingsley, who is currently an undergraduate of the Department of Agricultural Economics in Obafemi Awolowo University, Ile-Ife, Osun State, Nigeria is also the Managing Director/Consultant of NOVEL Nigeria (a fast growing international business brand and organized, purpose driven company with several subsidiaries). In a quest to carry forward its core belief (excellence) internally, enriching lives of societies to next generations, the management of NOVEL Nigeria initiated a plaform tagged; YES! Online Interactive Forum. One of the objectives of the online platform is to develop and nurture the young, dexterous workforce and aggressively promote the creative drive, sustainable development and foster unique values in upcoming entrepreneurs. In October 2017, NOVEL Nigeria is bringing the first online business summit to Africa cyberspace tagged YES! Festival. OAU Students Dreading Or Anticipating Strikes? For us in the OAU community, the past week has been a particularly dramatic and interesting week. Quite a number of events that erupted based on the Professor Elujoba trial reflected a lot of opinions of both students and staff members of OAU. In fact, we can say that every faction of the university had a role to play in the events of this week. First off, recalling to mind that the erstwhile Vice Chancellor was arraigned to court by the EFCC, leading to the call for the solidarity strike by the ASUU OAU Chapter on Monday and Tuesday, and then the controversy with the national body of ASUU. In addition, the power outage and water scarcity on campus and all the ruckus that ensued led to lecture boycotts by the Students' Union that generally brought only one thing to mind - Strike. The all too familiar feeling of impending strike was so pronounced that students envisioned that all academic activities would be suspended for a long time.